The official website for the upcoming Saint Seiya - Soul of Gold posted a second promotional video for the anime, briefly outlining the story before getting everyone pumped up for an April 11 debut. Soul of Gold will stream globally via the Bandai Channel and others, and you can see the promo and a synopsis below. Toei Animation announced the production of a new original Saint Seiya series: Saint Seiya - Soul of Gold. This new anime will start airing in April! Focusing on the Gold Saints, the series' storyline will develop right after the Hades chapter when they mysteriously come back to life in Asgard! As previously reported, Takeshi Furuta (The Comic Artist and Assistants) is directing the series, with Toshimitsu Takeuchi (Haikyu! !, Bladedance of Elementalers) on series composition and anime veteran Hideyuki Motohashi (Six God Combination Godmars) on character designs. 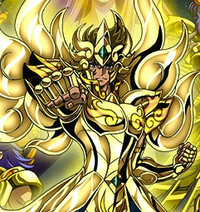 The cast sees the voices of the Gold Saints from the 2003-2008 OVA series Saint Seiya: Hades returning to reprise their roles. Thanks to CR user ShinSeiryuga for the tip! Joseph Luster is the Games and Web editor at Otaku USA Magazine. His first mini-comic, SLIME, is now available. His blog can be found at subhumanzoids. Follow him on Twitter @Moldilox.